Ariana Grande's big Wednesday, in which she debuted her ballad about her exes, "Thank U, Next" on "Ellen" before dropping a new music video for "Breathin," was nearly flawless, except for one small, literal misstep. During Wednesday's "Ellen DeGeneres Show," the singer got her "First Wives Club" on, sandwiched between two dancers all dressed in white. Grande also shared the moody new clip for "Breathin" at noon, spending the majority of the video enshrouded in smoke, with other scenes showing the world moving in a blur around her as she strides through the crowds. While performing "Thank U Next" on "Ellen," Grande tripped while trying to dismount a chair she was dancing on in high heeled boots. It appears her left boot got caught in the asymmetrical, flowy fabric attached to her suit. "Oh, my God!" Grande let out, before returning to the mic to continue her performance. Seemingly able to find humor in the moment, she later let out a giggle. Unfortunately for Grande, that wasn't her only gaffe. Though she made an exit from the stage that undoubtedly Elise, Brenda and Annie would be proud of – climbing the stairs while busting out "First Wives" moves – it turns out she was supposed to stick around to talk to the host. "She's gone. She left," a surprised DeGeneres remarked of her runaway guest. "We were supposed to come down?" a confused Grande asked after she'd returned to the stage. "I thought we were supposed to exit?" "Oh, my bad. I thought we were supposed to exit at the top, my bad," said Grande. "It's totally fine," DeGeneres said. "We're happy that you came back." Grande also got emotional while performing and appeared to choke up at one point during the performance. 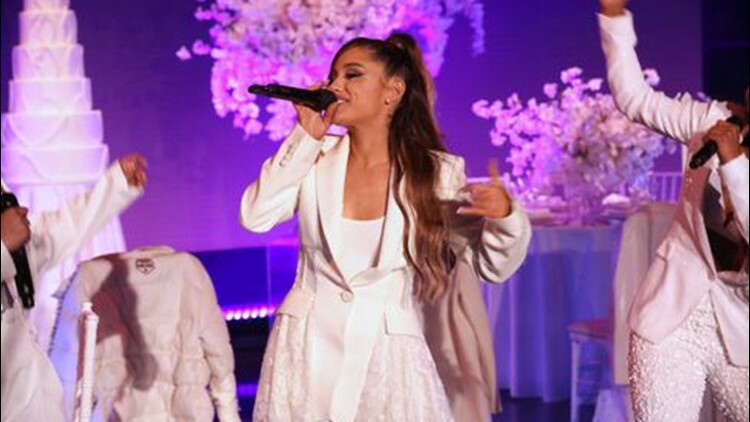 Her lyrics to "Thank U, Next," which dropped Saturday night, just before her ex-fiancé Pete Davidson's "Saturday Night Live" went on the air, celebrates finding happiness with her new love (herself) after failed relationships with the comedian, as well as Big Sean, Ricky Alvarez and the late Mac Miller. The anthem shares a self-empowerment vibe with "First Wives," a film favored by Grande. While singing on "Ellen," Grande and her dancers did some of the same dance moves as the revenge-seeking wives played by Goldie Hawn, Bette Midler and Diane Keaton, as they celebrated their independence while belting out "You Don't Own Me" at the 1996 film's close. Grande performed for the first time since calling it quits with Davidson for NBC's "A Very Wicked Halloween: Celebrating 15 Years on Broadway" special, which aired on Oct. 29, just days after announcing a world tour for her latest album "Sweetener."